my dad only liked her other sauce so she would make both sauces. Anyway this was a good dish. You can probably use any kind of rice mom always used the white rice. Cook rice according to the directions. In a skillet on medium heat saute' garlic until lightly brown, add basil and saute' for another minute. Add the diced tomatoes, tomato paste, garlic powder, paprika, salt, oregano, and water stir sauce and cook until tomato paste is dissolved add the sugar, simmer for about 20 minutes. 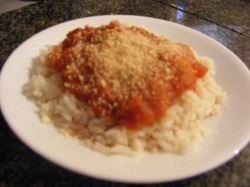 Add the sauce to your portion of rice and sprinkle on top with parmesan cheese.